The client requested a rectangular pool and spa with an automatic cover along with a cabana with an outdoor kitchen and bar, full bathroom with a shower, changing room, washer dryer and outdoor shower, all with the ability to operate the entire property from their smartphone. Before contacting our group, the client was unhappy with the initial design consultations they had received by others, as they had not addressed the grade changes on the property that our designers pointed out. This potential problem ended up having a dramatic effect on the scope of the project. 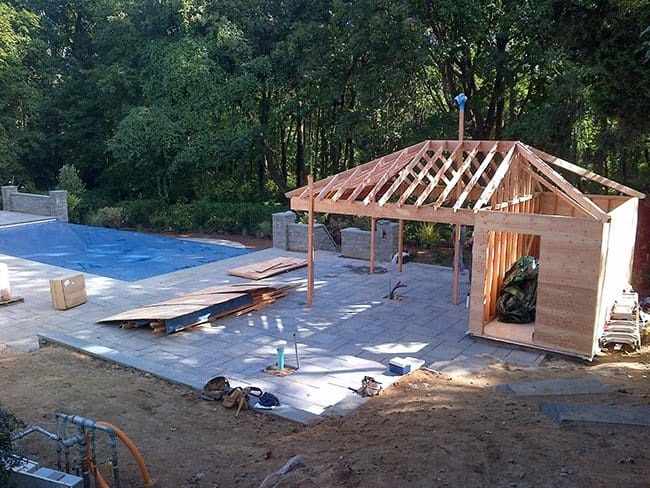 Some of the challenges we encountered were a 10 foot rear setback, a 20 foot side yard setback, an existing bluestone patio underneath an existing deck as well as a 3 foot height differential in the grade to an existing drywell. These conditions actually became the creative spark necessary to come up with the concept of using a full length 40 foot infinity edge pool to retain the sloping grade and allow for a multilevel viewing experience from every part of the yard. 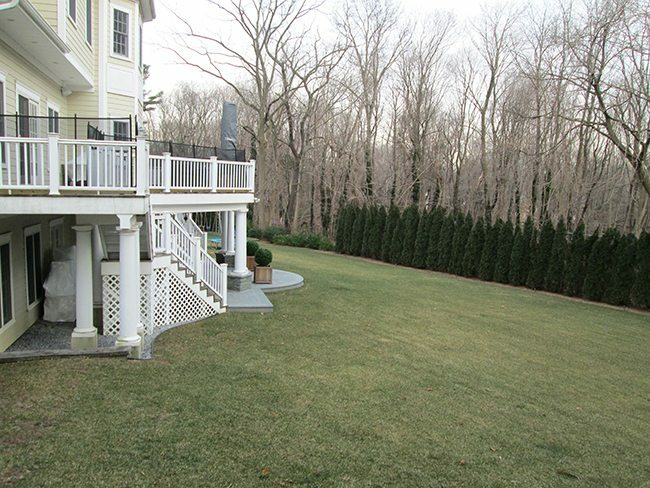 The decision was made to transplant the existing arborvitae trees along the rear property line thereby allowing the site line and infinity edge to continue unending into the adjoining nature preserve’s woodlands and create the illusion of a much larger property. 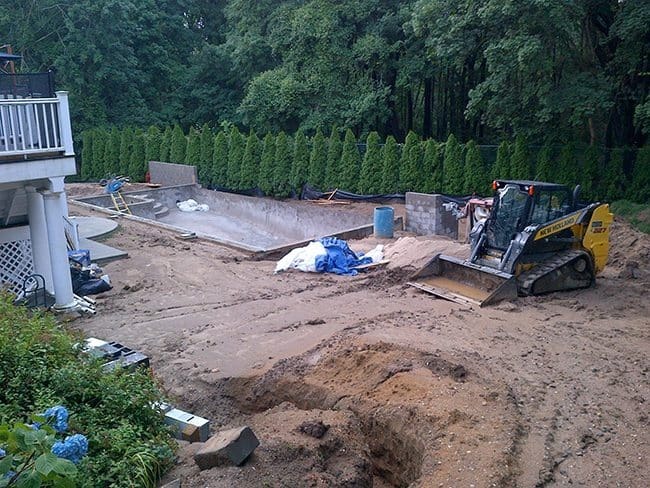 The 24.5’ x 40’ gunite pool contains a unique 8’x 8’ custom spa with a handcrafted radial bullnose coping allowing for maximum comfort when leaning back and enjoying the powerful jets. A 32 foot long bench was installed inside the pool, letting swimmers rest and lounge in the sun while functioning as a safety buffer for small children. 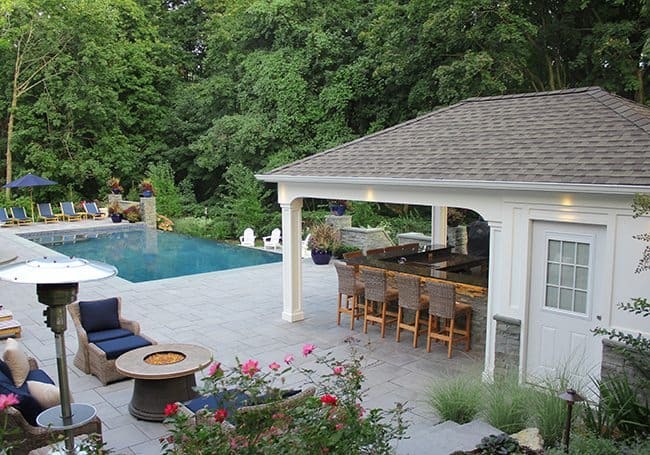 A major challenge was installing the automatic pool cover along the 40’ infinity edge. 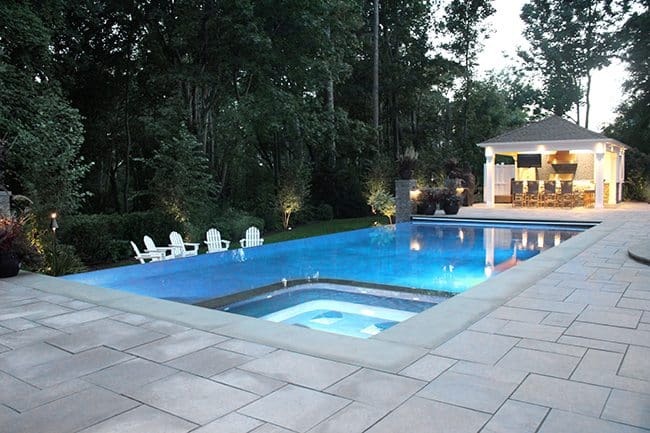 The cover is housed in the deep end of the pool under 24 inch wide Bluestone treads. The track for the cover needed to be installed precisely 3 inches below the infinity edge along the 40’ run to conceal it from view. 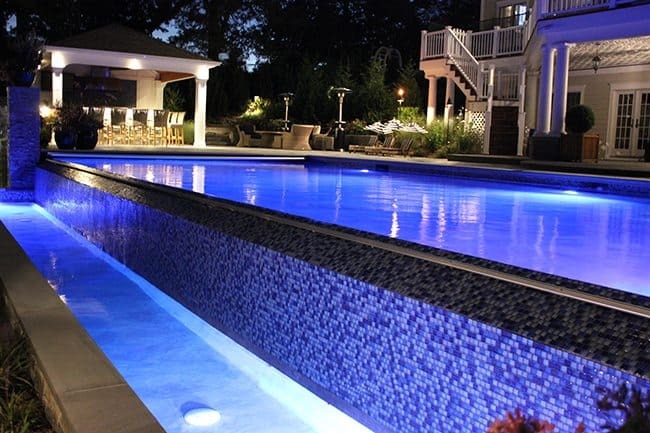 The pool, spa, and spill over trough sport five color changing LED lights as well as a salt water system. Complimenting the pool’s 40 foot long infinity edge with imported mosaic glass tile, we placed an 8’ fire trough in a location so as to take advantage of the water cascading over the weir wall. The 96 inch ‘line of fire’ allowed for a larger area to gather around while keeping the scale in tune with the scale of the long water’s edge and sending a warm glow dancing off the glass tile. 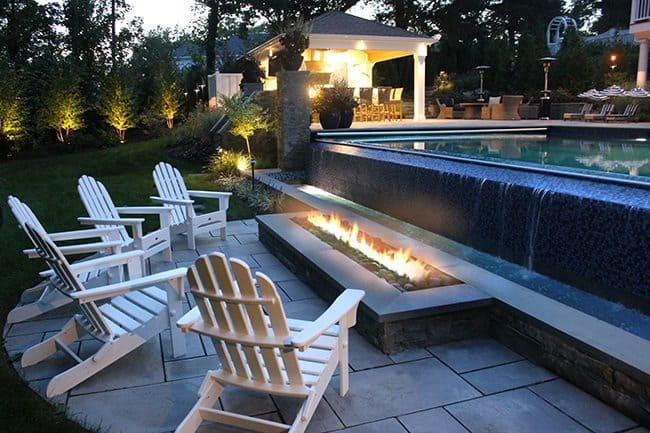 A radial Cast Stone patio was installed around the weir wall and fire trough allowing for a spectacular view from the surrounding Adirondack chairs. Another element that helped define the expansive view was to elevate the hand-cut stacked bluestone retaining walls 3 feet higher than the pool and compliment this wall with pillars in order to provide a safe barrier from the sloping grade, as well as, frame the view from the walk-out basement. A low profile evergreen hedge and decorative glazed pottery softens the stone work and provides seasonal color. The client requested a formal bluestone patio but was concerned with the heat from the full sun. We chose a Cast Stone paver which stays cool on the feet while preserving the formal look. The expansive patio provides ample room for multiple sets of chaise lounges and dining areas, along with a gas fire table positioned around a comfortable outdoor living room. 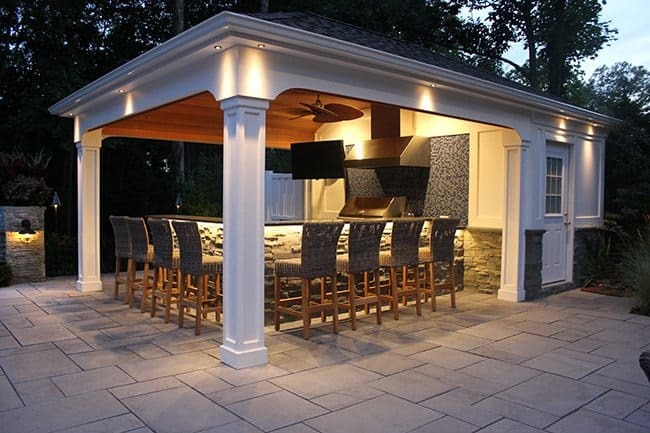 The custom cabana is outfitted with a wall-mounted flat screen TV, professional-grade Viking grill and exhaust hood, sink, ice machine and refrigerator — all highlighted with under counter LED tape lighting. The ceiling is tongue-in-groove Spanish Cedar and matches some of the exterior architectural features of the house. We used maintenance-free Azek material for all of the trim and posts, and carried the glass mosaic tile from the pool to the large backsplash. The outdoor shower and full indoor bathroom required heavy machinery in order to install the septic system into and already tight area deep into the woods. 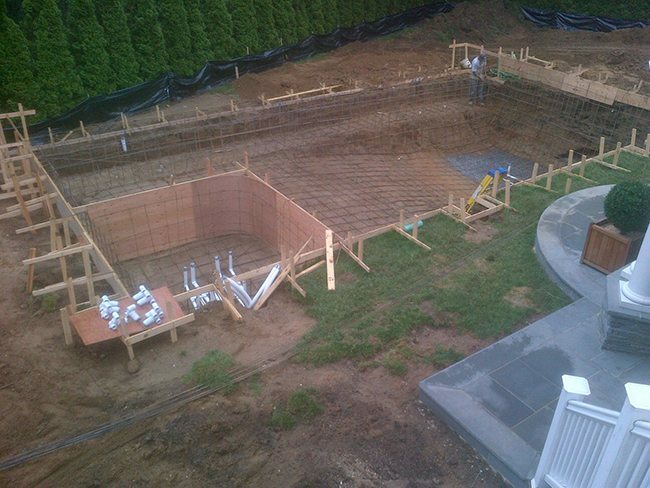 Amongst the pool construction, drainage preparations and electrical work, we needed to route 250 linear feet of independent gas line to accommodate for the gas grill in the outdoor kitchen, the fire table at the patio level, the 8’ linear fire trough at the pool level, and the utilities in the bathroom. 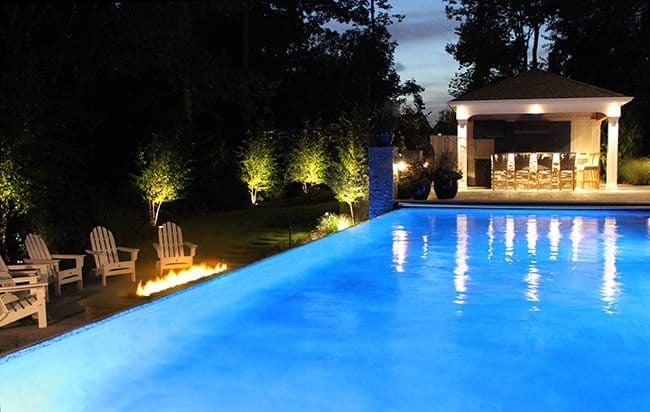 We carefully planned the lighting scheme to allow the eye to fade into the distance of the nature preserve while actively lighting the pool and patio areas. Soft up-lighting highlights various specimens such as the Crape Myrtles ‘Muskogee’ and Clump River Birch. A 10’ change of grade from the entrance of the backyard to the patio was one final challenge to be conquered as construction neared completion. We were forced to build a ramp out of the property and remove all heavy equipment and materials before we could build the entrance into the backyard. 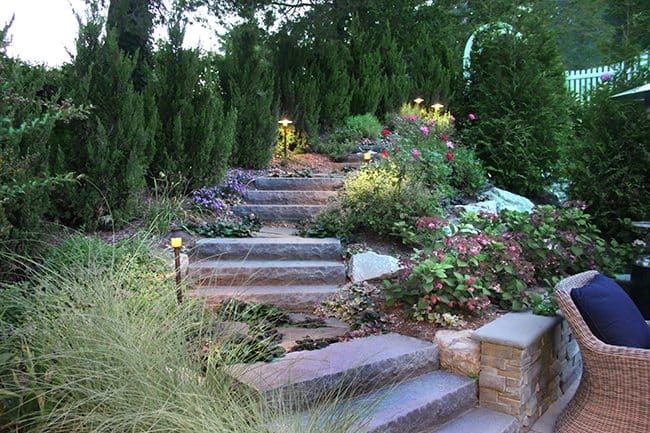 We then lowered 16 Cast Stone steps, by hand, into the back yard to build the staircase as well as all the plant material and growing medium. The result is an intimate entrance complimented with mixed perennials, evergreens, low-voltage path lighting, culminating into a custom grand arbor and gate. This backyard is now a gathering spot for large functions as well as intimate time with the family, all while operating the entire property with the touch of a few buttons on their phone.